When one of its employees became affected by breast cancer, Sandalwood, a North American commercial real estate company, turned to Wink Stratégies to organize a fundraising campaign for research against this disease. The mission of the agency was to design the operation, from the birth of the concept to the operational management of the events realized in 12 shopping malls in Quebec. 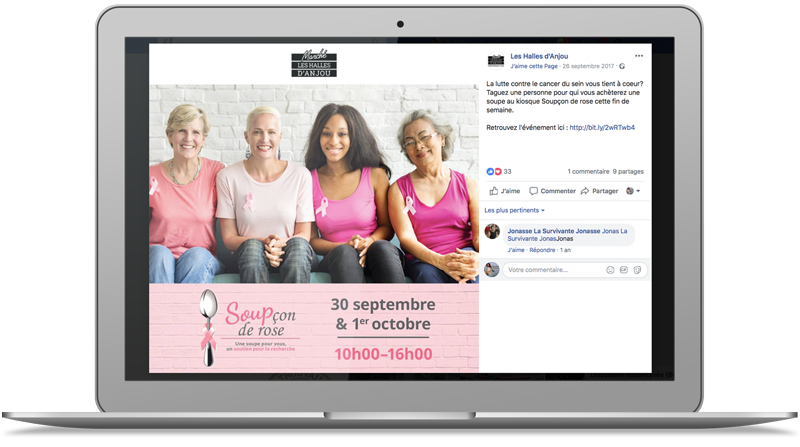 After monitoring and brainstorming, we have developed a rallying concept to allow the Quebec Breast Cancer Foundation to raise as much money as possible: the “Soupçon de rose” campaign. The event was held in October: the perfect season for soup! After the concept phase, the agency took the strategic and operational planning of the campaign in charge. To ensure that the campaign had the greatest impact possible, we took charge of its promotion on the social media of the 12 shopping malls. Through the creation of varied, attracting and engaging content, we have reached more than 75,000 people. We also put in place a media relations strategy through the creation of a press release which allowed the campaign to obtain a good presence in the print media, on the web and on the radio. – The installation and uninstallation of stands.